The United Nations Secretary-General, Antonio Guterres, on Wednesday condemned the killing of dozens of people near a polling station in the western city of Quetta due to a suicide attack, as voters headed to the polls in Pakistan’s general elections. The suicide bombing that killed at least 31 people and injured another 70 was claimed by the ISIL, or Da’esh terrorist group, according to news reports. The country has been witnessing outbursts of violence across the country in the lead-up to Wednesday’s parliamentary and provincial assembly elections. The elections mark only the second time that one civilian government has handed on power to the other, after serving a full term in office. Despite the violence, news outlets reported that millions of Pakistanis showed up to cast their vote. The 85,000 polling stations closed on Wednesday by 7 pm, local time. The President of the UN General Assembly, Miroslav Lajčák, also condemned the attack, which he called “despicable”. The suicide bombing in Quetta followed on from a series of terrorist attacks earlier in the month, including one in Mastung, in which 153 people lost their lives. 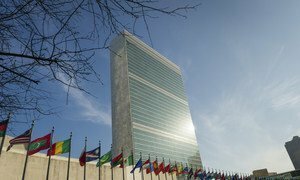 The United Nations Security Council has strongly condemned the terrorist attack in south-west Pakistan that killed more than 120 people and left scores wounded at an election rally Friday.